← Why walk the entire perimeter of Death Valley National Park? 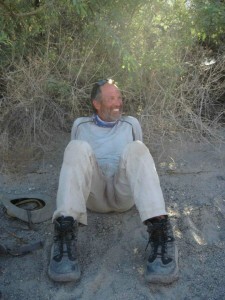 On Monday night, July 30, Marshall and Dave finished day 9 of their Death Valley National Park expedition. I did a rough calculation of the ground they’ve covered on foot: about 200 miles so far, with maybe another 200 to go. Average temperatures have been over 100 degrees during the day, down into the 60s at night when they’re at elevations over 7,000 feet. On their way around the entire perimeter of the park, they’ve trekked through valleys, up canyons, over mountains, across sand flats, down washes, among Joshua trees, past sand dunes and dried salt lakes, through pinyon pine and juniper forests, up and down hills, past marshes created by underground springs, around sage, salt bush, and mesquite bushes, along old railroad beds, and on some roads. They travel with ghosts of natives and old miners, prospectors, and explorers — sometimes finding ruins of old rock foundations, cabins, and smelters; wells, car parts, winches, bathing pools, towers, or mine shafts — sometimes feeling only the spirits of those who ventured in the desert before them. The variety, the scope, the size, and the beauty of Death Valley National Park proves nearly impossible to convey. Right now, Marshall and Dave are experiencing it in a way no one before them has ever attempted. One step at a time, self-supported, trekking around the park in the heat of the summer. The vistas are immense, swallowing them up in seconds when they trek away from any spot where Roger and I see them during our duly appointed trash-collection rounds. Seeing them virtually disappear across sand flat covered with sage and mesquite, or into a multi-colored, multi-hued and layered mountain landscape (like in the photo, right) suddenly gives you some idea of the size and depth of this, the largest park in the lower 48 states. Guessing the mileage to a feature in the distance — “How far do you think it is to those sand dunes down in the valley?” — is impossible. At least for me. I’m beginning to gain an even deeper appreciation for this magical place, and I’m just driving through and around the park, not experiencing the searing heat for 10 or more hours a day while hiking, carrying everything I need with me until the next water or food and supply cache. A “typical” day for Dave and Marshall starts at 4:30 when they wake up and pack their meager possessions, fill up their water bladders, and gather the trash and remaining items for pick up later. No time to cook breakfast. Just grab an MRE cinnamon bun along with some crackers, chips, and cookies for the day, shove them in your pockets, and set off around 5 a.m. The sun is coming up, so they don’t need their headlights for very long. They’ll trek for 10, 12, maybe as far as 16 miles to the next water cache, dig it up, refill their bladders for the next stretch, and move on. Another 10 or more miles — they usually cover at least 20 miles a day, sometimes over 30 — to the overnight cache location. Dig that up, set up “camp” for the night, eat, maybe do some laundry, brush teeth, and try to get to sleep around 9 or 9:30 p.m. Lather, rinse, repeat. 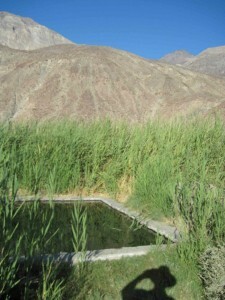 The artesian-spring-fed cement pond where Dave enjoyed a soak. Day eight: at least 30 miles south down into Saline through, through the North Pass pinyon pine and juniper forests, past the turn to the Warm Springs, past their food cache (they decided to eat some, then carry more forward with them in order to get through most of the valley in one big push), past the dunes, stopping near the old Salt Lake salt mines. As the sun set Dave got a soak in an artesian-well-fed pool, hidden in a marsh, complete with bullfrogs! 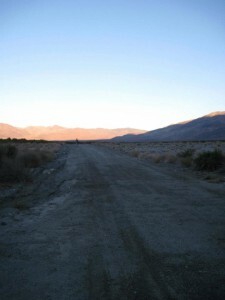 Day nine: about 21 miles – 11 miles south along Saline Valley road, then seriously cross-country, about 10 miles up and over the Inyo Mountains (Marshall reported via satellite phone at 11 a.m., “I think we found a faint trail”), continuing down to Lee Flat, which took until about 6:30 p.m. Another long day! So, what’s in those overnight caches? Anyone notice something missing? Place your bets. 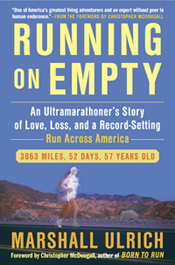 This entry was posted in Death Valley National Park circumnavigation July 2012. Bookmark the permalink. Following you like so many others, quite a job! One foot in front of the other over 50% done, its in the bag. Keep fueled. How are the HOKA shoes? Thanks for the updates, Heather. Sounds like the guys are moving right along. How are their spirits? I guess I should check in to the Facebook page for more on that kind of stuff. Maybe Marshall is posting right from the desert on a handheld. I’d be interested in how they’re navigating the perimeter, if it’s by roads, marked trails, GPS watches, or maybe some of all. How heavy are their packs? They must be toting a lot of water. Can the duo manage to run with all that gear or is it basically a fast hike? And, are they filming and carrying that stuff, too? What’s missing off your list may be coffee or tea, whatever they like in the morning. Thanks so much for keeping us all posted on Marshall and Dave’s trek. It’s really awesome what these guys are doing and hearing a day-by-day account is as good as watching the Olympics. I also really enjoy your writing. You have a wonderful tone. I’d also like to acknowledge you for all you’re doing. These guys are out in the desert, but you’re doing just as much work in your support of them. It’s a team effort and you are definitely a big part of that team.